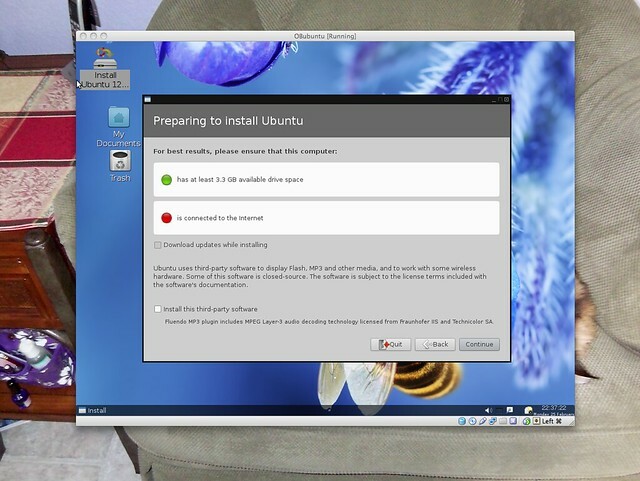 Finally have Virtualbox up and running with the Obubuntu ISO. 1- Is there a way that the build can be "burnt" to a USB stick easily? I think Remastersys installs Isolinux in its remaster process with the option of burning to a cd or dd-ing to a stick. It sure makes life a lot easier, and although I can now do things in Virtualbox, there are good reasons why it hasn't been on my computer until now. Will download RC2_2 and give it a whirl. USB : Please, look at the two new posts in the tips and tricks section. About obsession : you can also use your keyboard shortcuts while the "Exit" menu is also available for people not used to keyboard shortcuts. OK, tried to install this one and ran into the same problems. It wants to download updates during install. The check box for this option is grey out so I can not change it at install. I have a screenshot if you need it. How do I get Obubuntu to boot from a USB stick? I tried "dd" which just went through to installed grub, and then I tried Unetbootin but after Plymouth runs for a few seconds it dumps into a Busybox built-in shell. Hey Taco, Sorry this took so long for me to find. Here is a link to the program I was talking about. Have you checked the md5sum ? and about what I said last time related to "brigde" or "nat" for the network, can you look if you have the same as here ? I understand what you are saying and yes, it is all good. VBox is not the culprit. VBox is always conected to the internet on my rig. I have seen this before on other distros but they install just fine for me. If there was no internet then why is it trying to download updates? I would suppose it is greyed precisely because it can't connect to internet. I told you I think, it is a recent phenomena, a "ubuntu+vbox" issue which I solved really by chance because I didn't think of it. PING [url=http://www.linuxvillage.org]www.linuxvillage.org[/url] (212.85.158.4) 56(84) bytes of data. I'm getting a different result. The md5sums match. Then what the heck am I doing wrong? I am able to run the live version just fine. Hello, John. I really don't know. Have you checked the md5sum of the downloaded iso? Have you tried pinging google.com from the live CD session? Those are the only variables that come to mind right now. The screenshots I posted are from VirtualBox, too. OK, I will try and reinstall it today, I really want this to work. For whatever reason, I can not get this to run in VBox. It has some kind of connection problem that I can not overcome. It is strange as I can run just about anything else beside BSD in it. I even took the time to reinstall Vbox. Not sur ewhat to tell you on this. Can you just tell us what you find when you do as djohnston showed you, or as I have shown you ? See you guys tomorrow .